Every PS Mailer folder sealer machine has two fold plates, an Upper Fold Plate which is the larger of the two and a Lower Fold Plate, a bit smaller. Each one has its own functional location and cannot be interchanged. Proper insertion of the fold plates is essential to achieving perfect folds every time. 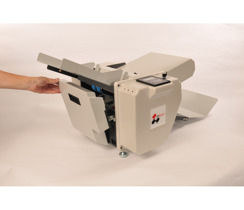 Position the Upper Fold Plate (larger) on the front end of your PS Mailers folder sealer machine where the forms are dispensed in their final folded format. 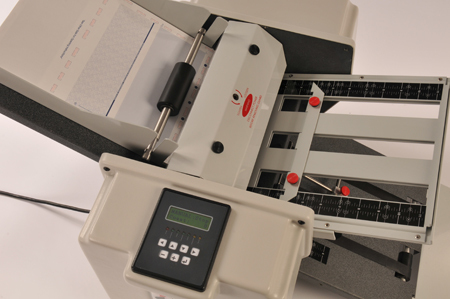 Looking at the numbers on the Upper Fold Plate, think of it as a ruler and position the fold plate so the lowest numbers are inserted into the PS Mailers machine first, closest to the rollers. The largest numbers on the Upper Fold Plate should be at the end of the model, farthest away from the major mechanics of the PS Mailers machine. As the Upper Fold Plate is inserted, it should fit easily and at a slight angle. To ensure the Upper Fold Plate is firmly in place, look underneath the plate and verify the cutouts sit securely on top of the four black pegs. With a firm grip, apply slight pressure downward to ensure a properly secured fit. 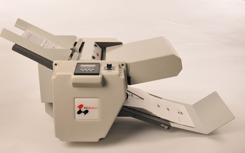 The Lower Fold Plate (smaller) is placed on the back side of the PS Mailers folder sealer machine and sits parallel to the motor cover. Again, looking at the numbers on the Lower Fold Plate and thinking of it as a ruler, position the Lower Fold Plate so the lowest numbers are inserted first and are closest to the rollers. 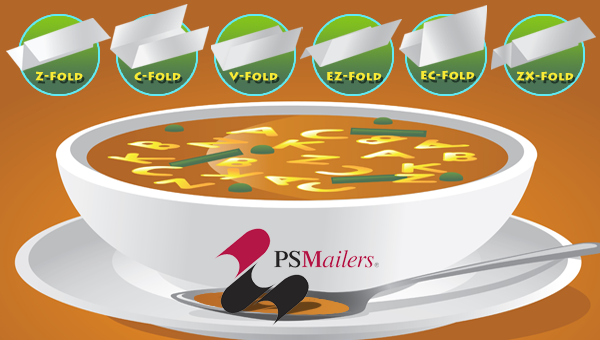 The highest numbers should be farthest away from the main mechanics of the PS Mailers machine. Ensure the Lower Fold Plate is firmly in place by looking underneath the plate and be certain the cutouts sit securely on top of the four black pegs. With a firm grip, apply slight pressure downward to ensure a properly secured fit. Proper fit of both fold plates is essential to getting the perfect fold every time. If you periodically clean the PS Mailers machine, be sure to follow these fit techniques afterward to ensure smooth and perfect operation as well as perfect folds. Thanks for visiting today. Check back soon for more tips on getting the best performance from your PS Mailers investment. Let me know if you have any specific questions. That’s what I’m here for. Click below to submit your question today.